First and foremost, remember this is your daughter’s day though your ideal styles for her dress may differ from her style she still needs your approval! 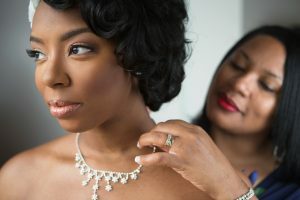 We find that moms tend to have the most influence on the bride’s decision to ‘say yes’ to the dress. So MOB this one is for you. We all know mother knows best, but take the time to listen to what she wants, what makes her feel good, and therefore makes her happy! That is what the experience is all about. Suggest a family heirloom over wearing your wedding dress. Wedding dresses have changed so much over the years that chances are she has no interest in wearing your gown. Perhaps offering a family item, i.e., veil, brooch, earrings, etc. may be more suitable offer. She really needs you there for stability and support. It’s crucial to keep the atmosphere as calm and relaxing as possible. Wedding dress shopping is a very emotional experience and creates a lifetime memory and needs to be treated delicately. Wait on the MOB dress. Don’t start shopping for your MOB gown before she has her gown—she will love to be a part of your dress shopping experience too. Wait to shop until the bride-to-be is comfortable with her selection. Don’t pre-shop without the bride. Unless she asks you to, don’t start pre-shopping online or otherwise—do it together. Listen to what she wants first. Styles have changed significantly over the past several decades with the influence of Hollywood and the red carpet;there are more dresses and bridal dress designers than ever! Just like you needed a dress with mutton sleeves in the 80’s, your daughter might also want a dress featuring the latest trend. So bare with the bling and pops of color because it’s not your dress! Come with a budget in mind. Discuss budget ahead of time. This will make for a more peaceful and efficient shopping experience.